6:15pm EST - Client update is out, we're updating our servers now. 6:07pm EST - The devblog is live! 5:00pm EST - The update is still pending. Our weekly and bi-weekly US servers have just wiped - we'll restart them to update once the patch is live. 3:50pm EST - The staging branch is having a lot of issues at the moment. The devs are still working on getting to the bottom of it. We shut the stream down in the meantime, check @Rustafied for news as we get it. For anyone wondering the status of wipe times for US Rustafied servers today: If the update is not live (or very close to) by 5pm EST, we will wipe our US servers. We'll then restart them once the update comes out, but not wipe again. 12:30am EST - Update day is upon us! With the forced map wipe just around the corner - Dec. 7th - there are some big changes about to come in. Given that, this update is a bit sparse on content, but does have some interesting changes. Our yearly charity event is this weekend! We’ve got a ton of special guests, prizes, games, and events throughout the 12 hour live stream. 100% of funds raised this year will go to Direct Relief - a not for profit organization which helps victims of natural disasters and poverty in over 80 countries. Check out charitablerust.com for more information and be sure to tune in and join in on the action starting 11am EST on Saturday! The Charitable Rust 2017 skins are now live on the rust item store! Proceeds from the skin sales will go to Direct Relief. 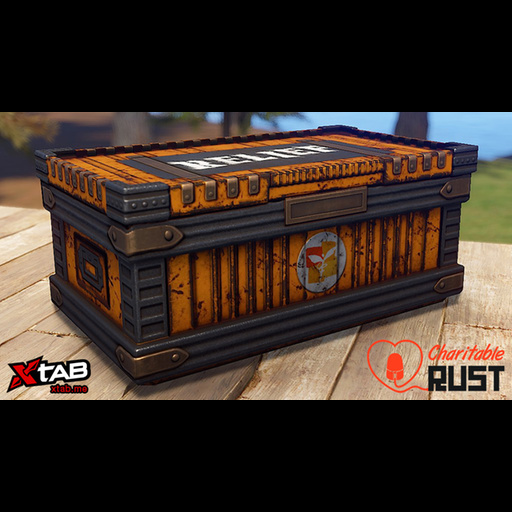 A huge thank you to Xtab and Facepunch for making this happen! A special thanks to Mambo Sauce for creating this video! Finding dropped items just became a lot easier with the addition of object outlines. Off by default at the moment, this feature can be turned on by running ‘effects.showoutlines 1’ in console. We’re seeing some changes to firing dynamics this week. First, the Thompson may be much more viable as its aimcone has been reduced. Also, semi auto weapons will feel a bit different as their recoil has been tweaked and aim sway reduced. Finally, standing and tapping will be more accurate as stance recoil only comes into effect when moving or after the first shot. Tossing grenades at your foe’s will be much quicker after this update. Not only does the pinpull and release happen much faster, grenades always throw at max velocity (so there is no longer a need to hold for a greater throw). We’ll be seeing some new flavors of Python’s in game soon as the weapon is now able to be skinned. Our newest favorite minigame will be a bit easier on the knees this week as the X’s will no longer be placed low enough to require a crouch when whacking wood. Our newest server is going live: AU Long. Based in Australia (dur), this is a clone of our US and EU long servers. Long and short (see what I did there? ), it’s a 200 pop server which only wipes when forced - coming to an official list near you soon. We’ve been hearing a lot of chatter about blueprint wipes (specifically, requests for one). Facepunch has said they may force a blueprint wipe at the next forced map wipe (on December 7th) but we have yet to hear confirmation on that either way. We’ve previously said we won’t wipe blueprints on Rustafied servers till Facepunch forces, but it’s also our priority to provide the best experience for players. Given this, I figured I put out a poll to the community to see if they would like a blueprint wipe on December 7th. Note: These results will not necessarily dictate whether we will or will not wipe blueprints on Rustafied servers - mainly looking to gauge the temperature on this one.